I. C. Wiener is a fictional employee of Applied Cryogenics. While he worked at Panucci's Pizza, Fry is called to deliver a pizza to this person, and understands the prank call too late. Instead of making the trip a complete waste, he eats the pizza. In "Anthology of Interest I", Fry asks what would've happened had he not fallen into the cryogenic tube. It is revealed that the existence of the universe itself is reliant on his having done so. When a Fry-hole, or Hawking-hole, depending on whom the viewer believes, opens to reveal monsters, and one of them claims to be "Icy Whatever" in order to acquire the cheese pizza. Fired from Planet Express in "The Cryonic Woman", Fry gets a job at Applied Cryogenics. He then orders a pizza under the name I. C. Wiener, which Leela delivers. In "The Why of Fry", it is finally revealed that the original "I. C. Wiener" was none other than Nibbler, who placed the call in order to lure Fry into Applied Cryogenics, where he could be frozen for a thousand years to fulfill his destiny of saving the entire universe. 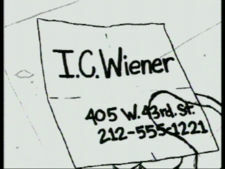 I. C. Wiener's "address", and in turn, Applied Cryogenics', is actually David X. Cohen's mother's address. When Nibbler gives the name to Mr. Panucci in "The Why of Fry", he gives it in a very formal way resembling typing instructions: "I-period-C-period Wiener". Strangely, Panucci sees nothing odd about this, though he does notice that Nibbler does have a body feature abnormal to humans. 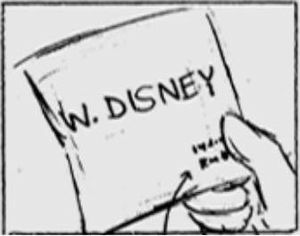 In the original storyboard for "Space Pilot 3000", the false name that is called into Panucci's Pizza is "W. Disney", for "Walt Disney", a reference to the urban legend about Disney being cryogenically frozen. The idea of mm"I. C. Wiener" turning out to be Nibbler was a concept that the animators had for a long time. Indeed, as Fry's chair falls in "Space Pilot 3000", a quick shot of the chair's legs reveals Nibbler's shadow on the wall. The name is an obvious pun for "Icy wiener." Fry: Hello? Pizza delivery for, uh... [He reads the delivery note.] ..."Icy Wiener"? Aw, crud! I always thought at this point in my life I'd be the one making the crank calls! Fry: Who are you monsters? Is one of you I. C. Wiener? Zoidberg: If that's his pizza, then I'm "Icy" whatever! Mr. Panucci: [on phone] One pie, nothing good on it. Name?